Cook rice following the packet directions. Set aside and cover to keep warm. Heat half the oil in a large, non stick frying pan over medium heat. Add salmon and cook to your liking (3 minutes each side for medium). Transfer to a plate and cover with foil. Set aside for 5 minutes to rest. Heat remaining oil in a large frying pan over high heat. Add the kale and cook, tossing for 2 minutes or until kale begins to wilt. Add the rice and ginger and cook, tossing for 2 minutes or until well combined. Add lemon to taste, tossing through to ensure all leaves are coated before taking off the heat. Arrange the rice on serving plates. Top with salmon and drizzle with olive oil and a squeeze of fresh lemon. Serve immediately. 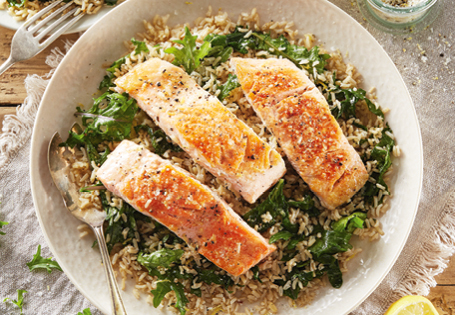 Tip: For a crispy skin, rub salmon skin with salt before cooking. Cook the skin side first, pressing down on the fillet to ensure all skin is touching the pan.